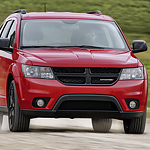 If you are looking for a mid-size SUV, the Dodge Journey is one of the top models in its class. At Courtesy Chrysler Dodge Jeep Ram, our team strives to keep our consumers informed about the features of our models, so you can read further to learn about a few performance features of the Journey. The Journey offers two available engines. The award-winning 3.6L Pentastar V6 engine has a highway driving range of 500 miles. This engine is paired with a six-speed automatic transmission that comes with AutoStick and front-wheel drive. The other engine in the lineup is the 2.4L 16-valve four-cylinder engine that is paired with a four-speed automatic transmission. This engine comes with dual Variable Valve Timing (VVT) and offers 25 highway mpg. Electronic Stability Control with Electronic Roll Mitigation can help drivers regain control by applying individual braking and reducing engine power. This feature also prevents wheel lift and helps reduce chance of a rollover.